Last October I read the announced specs for the Sony A7riii and just knew that this camera was the one that I’ve been waiting for since my first digital camera in 1995. When reports came in from first users, the comments that that grabbed my attention were “the images look so real”, “the clarity is hard to believe”, and “the colors are so spot on and alive”. DXO Mark’s sensor image quality rating of 100 for this camera plus much faster handling, a 15-stop dynamic range, and a frame rate of 10/sec led to the widespread suggestion that the Sony A7riii might be the best all-around camera for outdoor and travel photography ever (so far). My camera arrived 30 days later, and I resisted the impulse to start shooting immediately. Instead, I spent a week familiarizing myself with the camera’s new features and menus and customizing the function buttons. The few images that I made before and after the holidays revealed a different image quality level than I had ever experienced. Like others, I was amazed by how real the images looked, which led me to recollect how striving for “realness” has guided my photography for some 43 years. Though I made my first darkroom prints in 1951, it wasn’t until 1975 that I developed clear objectives for what has since been an unabated passion. That sudden clarity resulted from viewing an Ansel Adams exhibit at the G. Ray Hawkins Gallery in Los Angeles and also reading a quote by him explaining that the motivation to develop his Zone System was a desire to reliably produce images that would reliably transmit what he saw and felt when he made the exposures. That connected strongly with me, and making images of nature with maximum “realness” became my mission. As my outdoor color images fell short of my new objective, I concluded that color was a more difficult medium to master, and placed most of my emphasis on monochrome photography. Though color is a more complex medium that does require greater knowledge and effort, it didn’t occur to me then that color film capability was too limited. Every color film had an Achilles heel due to poor reproduction of at least one primary color. With black and white film, once I suspended disbelief by accepting monochrome rendition as reality, I was free to concentrate on achieving fine detail and controlling contrast and tone placement. While color film did improve, broad color fidelity remained a far-off goal. In the early 1990’s, the Photographic Industry took an “If you can’t beat ‘em, join ‘em” approach, and introduced super-saturated films like Velvia. For me, the images were fun and different but were even further from reality. I bought a Casio QV-1 digital camera in 1995. As primitive as it was, the future seemed clear. 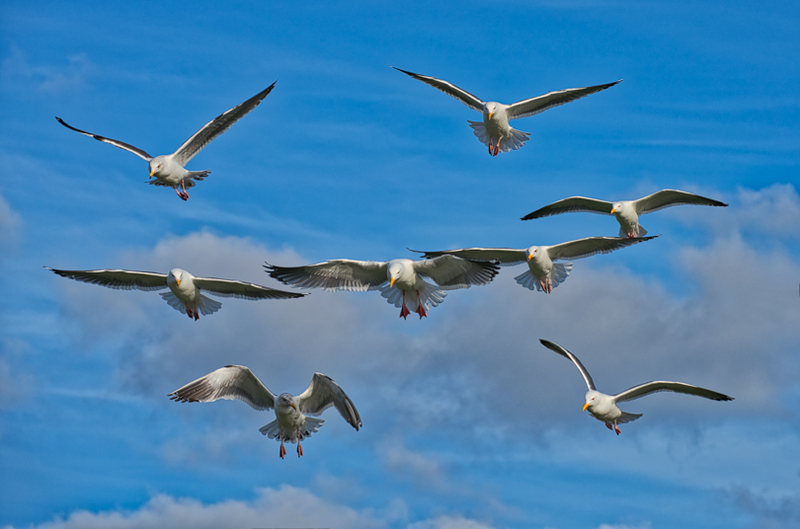 Direct digital capture should logically lead to a more realistic capture of almost any subject. And, over the past 20+ years, that’s precisely what has occurred. But, how does one define and measure realness? Faithfulness to reality is a great objective; But, is there any such thing as reality? In a technical and philosophical sense, I’d have to say no. We only see and experience our environment, our “real world”, through biologically evolved senses. It is a fact that other creatures see their environment very differently. Their vision often extends into the Ultraviolet and Infra-red ranges beyond what we egocentrically call the visible spectrum. Even some human individuals may have an extended sensitivity outside the normal range. So, our visual reality is obviously subjective. But, in a practical sense, most people have normal color vision and might agree that some images appear more real or faithful to the original subjects than others because of specific qualitative factors. Little to no noise or disruption of image definition at a micro scale. These four requirements fit well with Image Quality (IQ) measures as defined by testing labs like DXO Mark. And, no one can argue against the fact that a steady stream of improvements in equipment and software have made it increasingly possible for photographers to produce outstanding images with remarkable fidelity to the captured subjects. Of course, it’s a given that the photographer’s vision, skill and discipline greatly influence the final product. As a rough check to see how evolving technology might have increased my own ability to produce more realistic images, I studied 450 of my most successful images selected from 30,000 images I’ve taken in the past ten years when digital technology has really blossomed. There are perhaps 40 or 50 of these that strike me as rendering the original scenes with elevated realism. I used twenty-one of these in this article to illustrate and support its conclusions. Yeah, this is highly subjective. But, I’m the only person who can remember what those scenes looked like when I squeezed the shutter button, and who can evaluate how well these 21 help me re-live those experiences. There are no film-based images in this group as I went completely digital in 2002, and none of my film images meet my current criteria. While I believe that the conclusions put forth in this article are appropriate, the one caveat is that 810-pixel wide images do not allow the reader to see what I see on my 24-inch 5K monitor. In retrospect, I think that this period represents a transitional period during which digital imaging proved its technical superiority over film, but had not yet fully come into its own. Some outstanding cameras like the Nikon D 800/800E, the Sony A7r and the Pentax 645D, came on the market with sensors in the 36 to 40 MP range. There were others as well. But, these were the cameras that enabled me to start producing images that achieved my objectives for the first time. I averaged two to three such images a year during this period. The following nine images are representative of this group. Though the Mamiya ZD’s 22 MP silicon sensor is now old technology, it was more than adequate to handle the overcast lighting and a limited color palette. As in all cases with larger negatives and sensors, less enlargement is required for a given print size which keeps noise and digital artifacts less noticeable to our eyes. 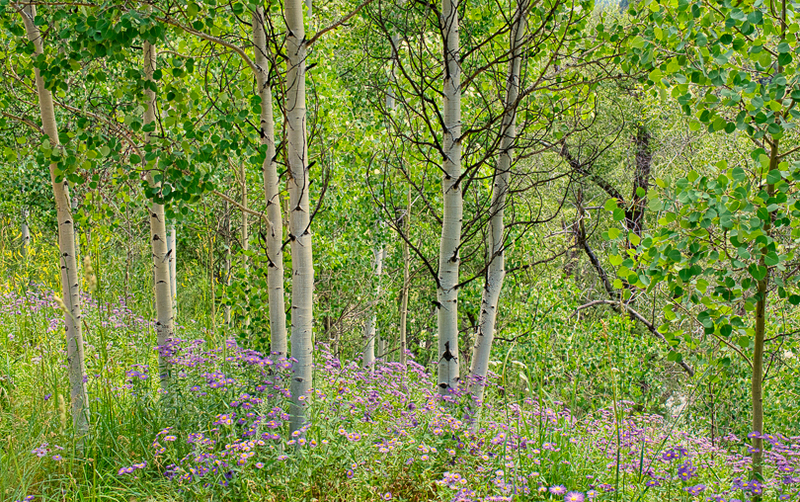 This image was produced by a 12MP four/thirds sensor and a Leitz-designed Panasonic lens. The prevailing lighting ratio was low and within the sensor’s capability. The color rendition closely matched the distinctive colors of that sunset, with orange and red in the lower sky transitioning to soft pinks and blues in the upper sky. Though darker tones of the canyon and Lookout Studio grounds are soft, books and papers seen through the windows are crisply rendered. 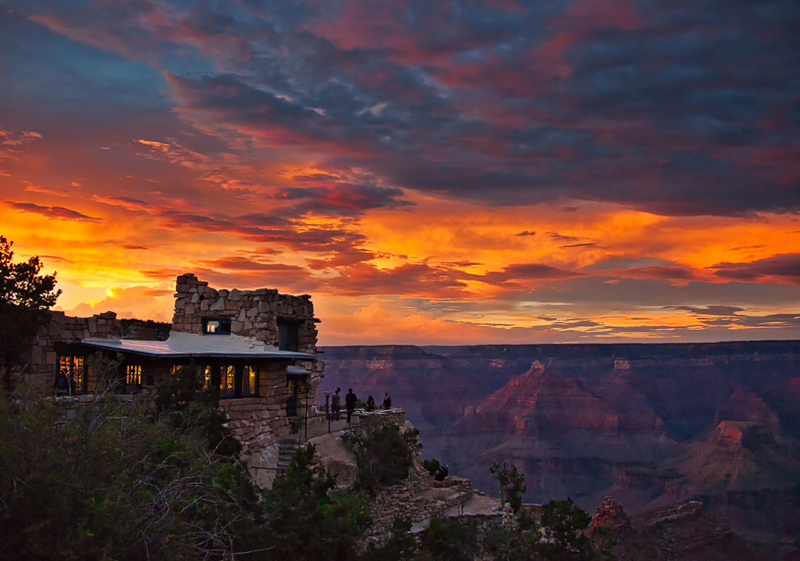 This photograph was exhibited in the Phippen Western Art Museum in Prescott, AZ in 2016. 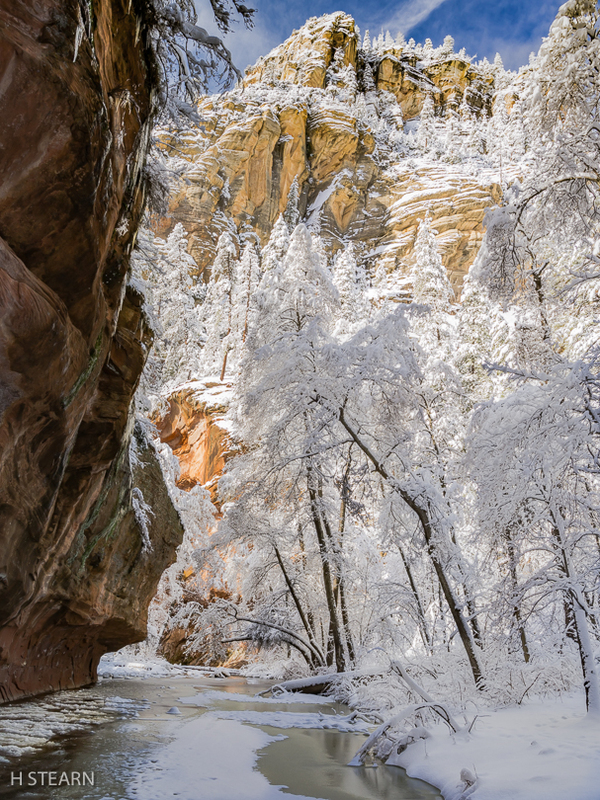 The contrast range in this scene was extreme, ranging from sunlit snow in the upper canyon to heavily shaded dark rock. The large, high dynamic range of the Pentax 645’s sensor’s tamed this and accurately portrayed all of the tones. Pentax 645D image quality is almost as good as that of the successor Z model. 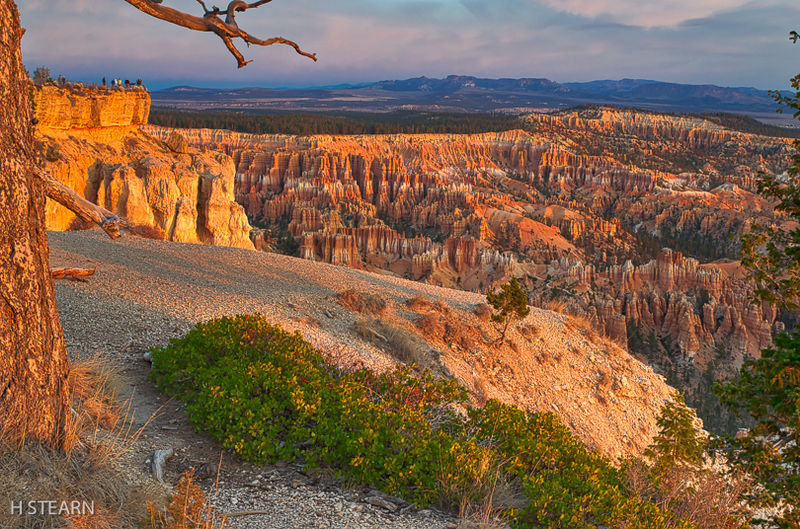 The delicate warm tones of the first rays of sun on the sandstone spires and the foreground slope were perfectly captured. 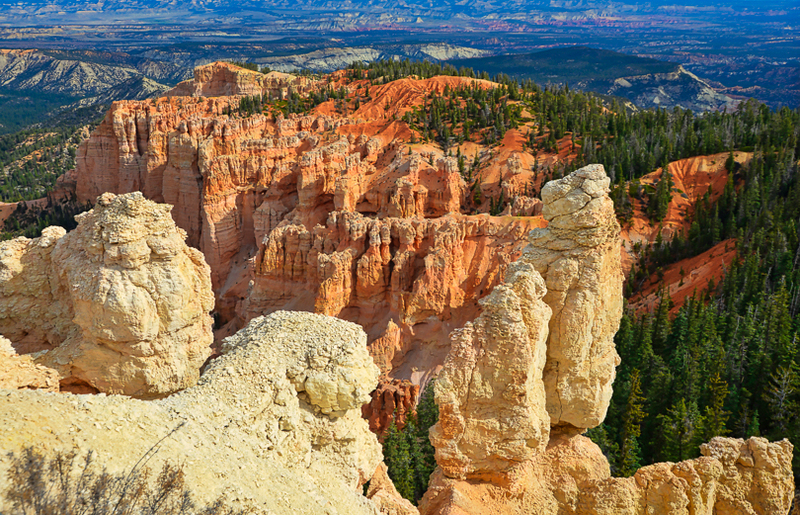 Nikon D800 image quality is also evident in the next image of Bryce. 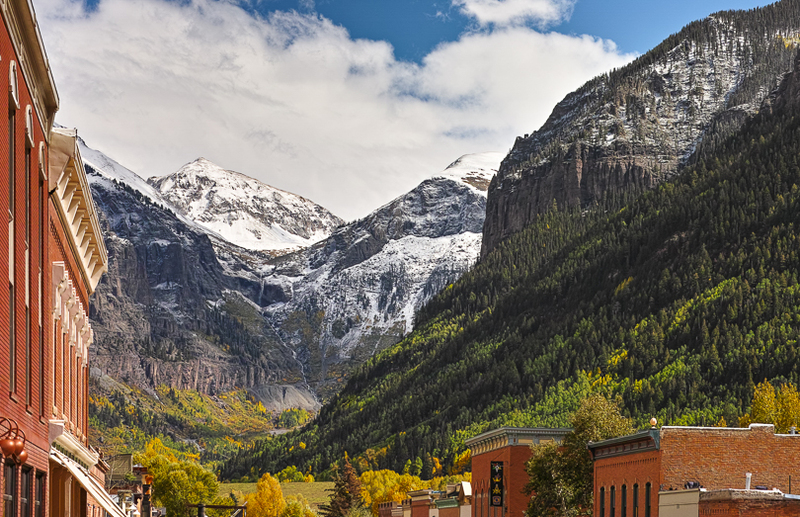 Consistently fine detail, clarity, crisp lines and super color accuracy were hallmarks of the Sigma DP3 Merrill which clearly shows in the Telluride image, and again in the Mt. Rushmore image. 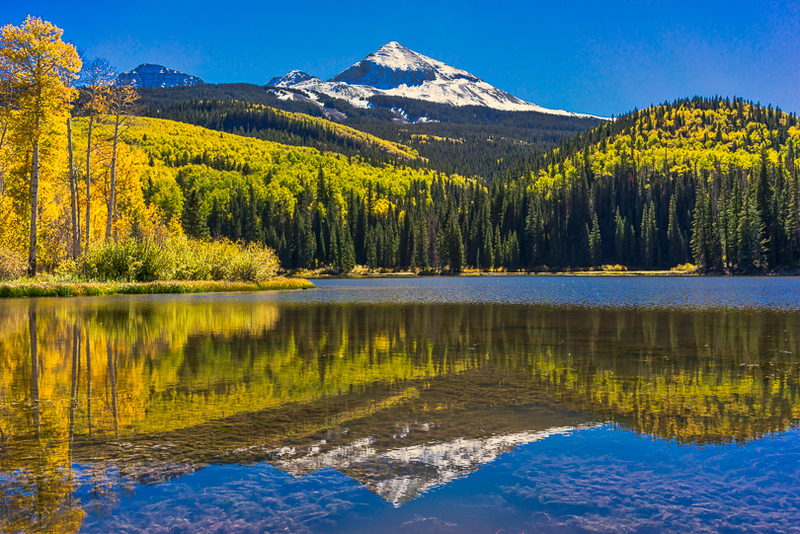 This high contrast Woods Lake scene severely challenged the Sony A7r. This image still looked quite real because it was perfectly exposed to avoid highlight burnout while restricting opaque shadows to less important parts of the scene. With the introduction of the 42MP A7rM2 in 2015, producing highly realistic images became a more regular occurrence until replaced by the Model 3 three years later. 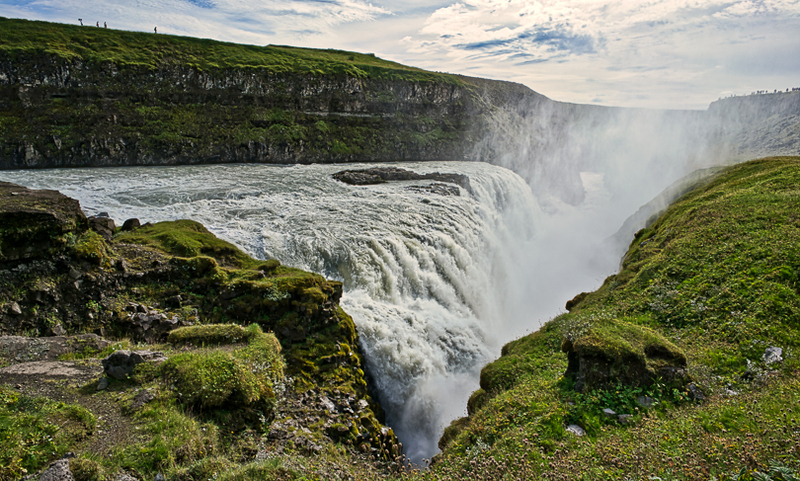 The Gullfoss image displays perfect tonal placement in very high contrast lighting that created much glare. 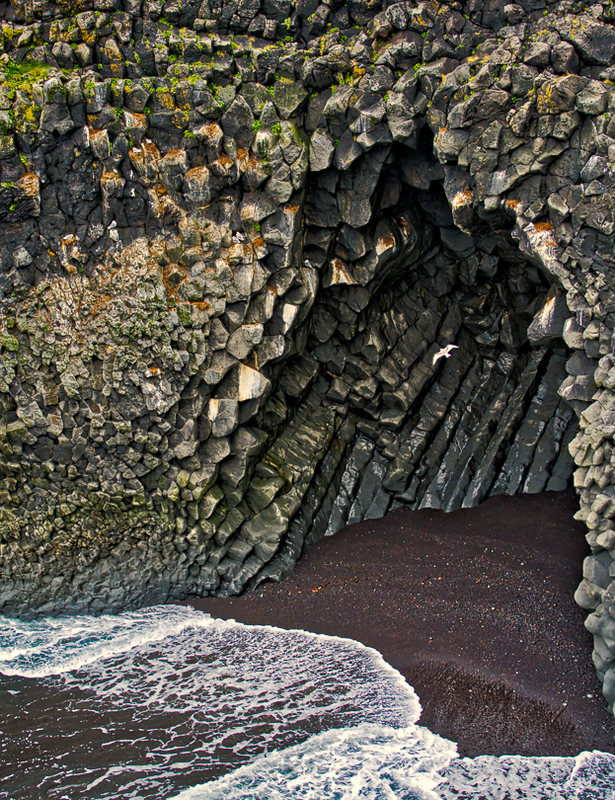 The delicate splashes of color in the basalt cave image and the subtle range of white tones in the wave are realistically rendered. 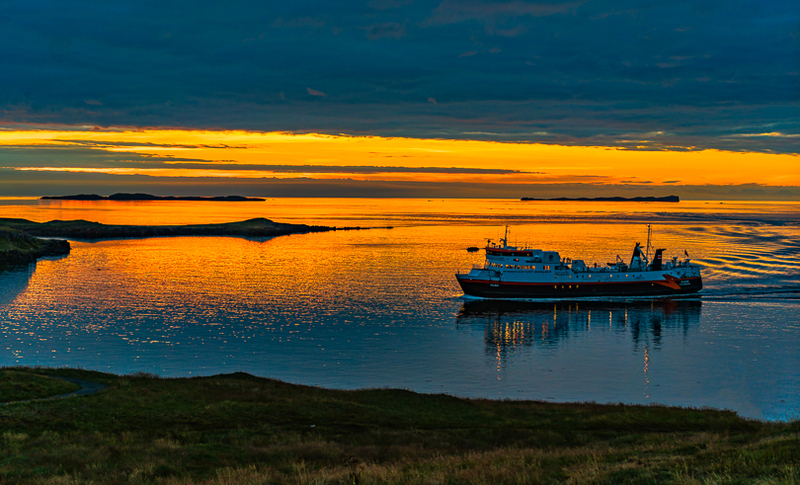 The A7rM2 also captured the brilliance of the Stykkishsholmur sunset in Iceland with more detail than I originally noticed. The Agathla Peak photograph is simple. But, on close inspection, the subtle color variation of the hardened lava is reproduced perfectly, as is the three-dimensional appearance of each cloud. For me, 2017 was a watershed year in photography. The Sony A9 and A7riii were introduced within six months of each other. While amazing the photographic world with the A9’s speed, almost lost in the marketing hype was the large boost in image quality that was a byproduct of resorting to partial image stacking to increase data transmission speed. Though the A9 has a 24 MP sensor, the image quality is so good that producing very real-looking images requires little effort. When that same sensor technology was extended to Sony’s 42 MP sensor late 2017, my long-time dream came true. For the first time in fifteen years, I now own only one camera outfit consisting of two camera bodies sharing seven outstanding lenses. One lens is the best in category Sony 70-200mm f2.8 GM zoom. It made two of the following images. 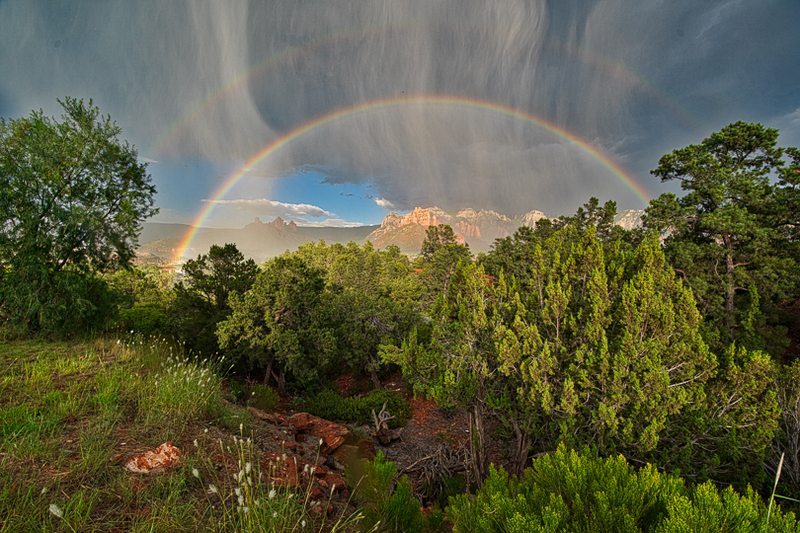 A few specific comments on the above images: The rainbow scene was extremely challenging. In what was overall very bright sunny lighting, a fast moving dark cloud moved toward me and dropped torrents of rain. The Sony A9 with the Sony 12-24 f4.0 zoom handled this disparity in lighting and copious surrounding detail easily and super realistically. 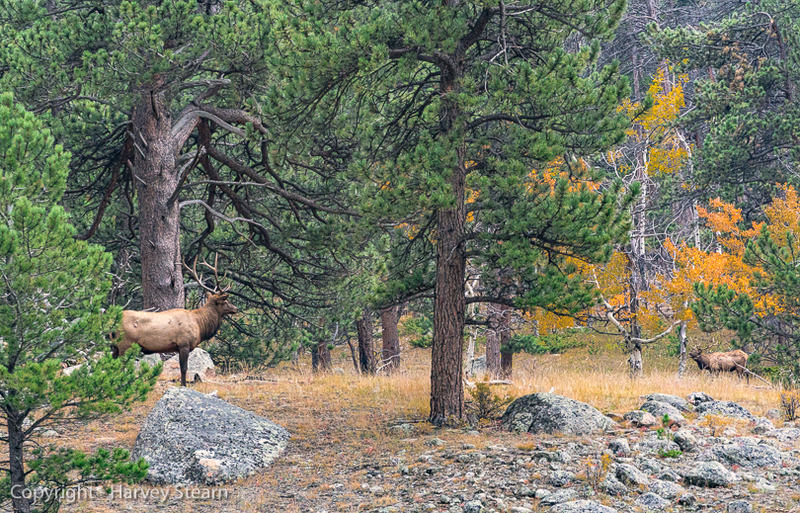 The diverse forest scene with rival bull elk is perfectly captured. In particular, the delicate lighting on the old growth pine tree is exquisite. 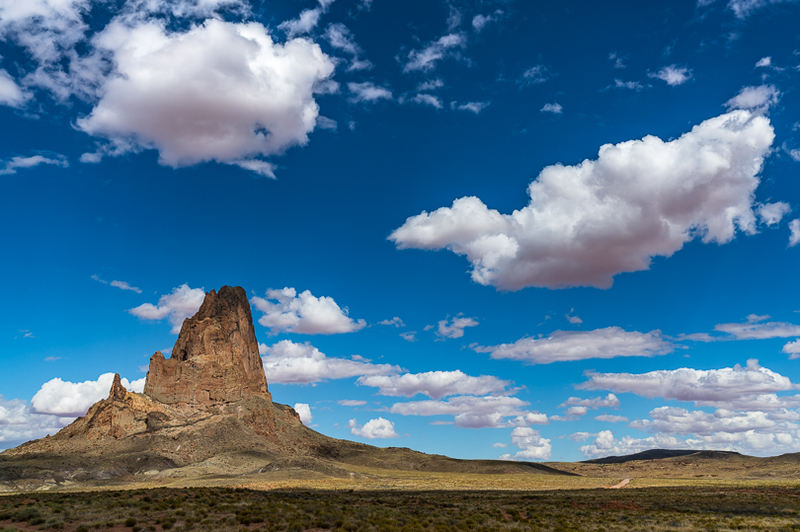 The Navajo Turquoise image was made using the Pixel Shift feature of the Sony A7riii. 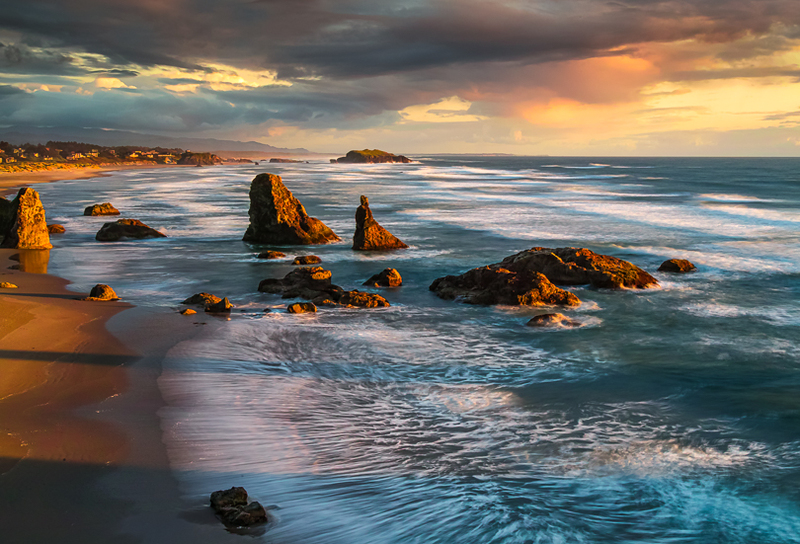 The clarity and fine detail in this image are all that a photographer could wish for. 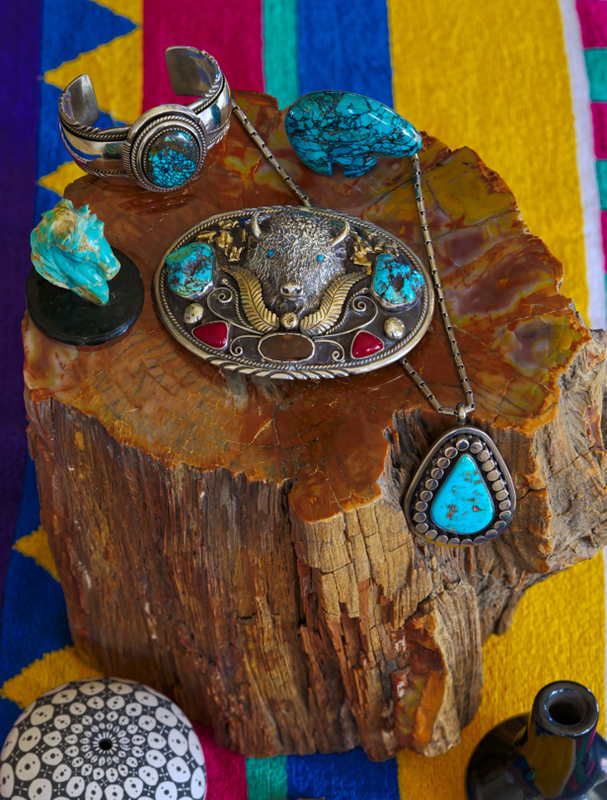 The varying blue and blue-green colors of the turquoise stones were rendered perfectly true to life, as were the reds and oranges in the petrified log cross-section. 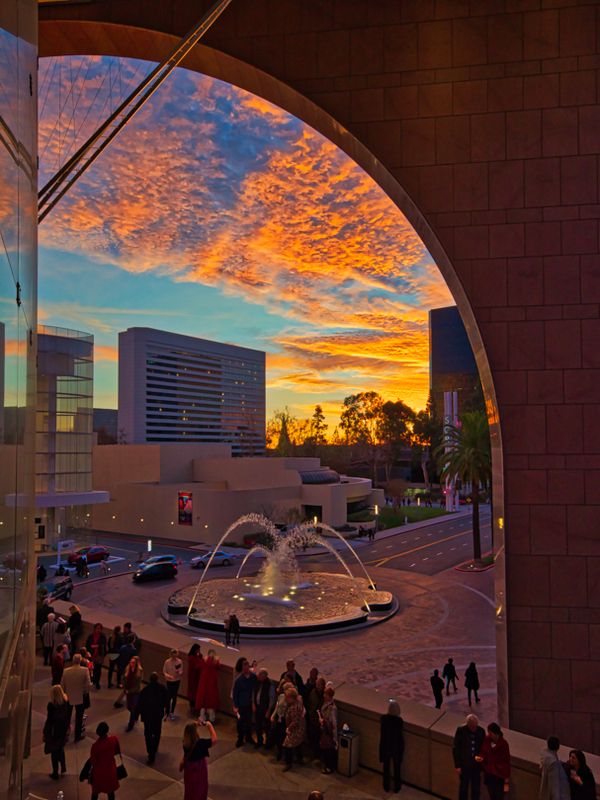 The most amazing aspects of the Performing Arts Center image is that the brightness range went from a bright orange-pink sky to deep shadows in the shaded foreground. But, the A7riii managed to pull good color and shadow detail from the darkest tones. We are only four weeks into 2018 as of this writing. But, it seems that with careful technique, almost every image that I take with the Sony A7riii is super-real. The lead-off image, shown at the beginning of this article, “Amphitheater”, was chosen for good reason. This was shot in mid-afternoon in full sun with strong shadows. This is a single image over-exposed one full stop (ETTR) to maximize information enabled by the A7riii’s 15-stop HDR capability. The rich color and textural detail in the shadows match what human eyes see because we scan small parts of the landscape with sharp narrow focus vision which the iris then adjusts for brightness. The human brain then automatically integrates the visual data into a single image. In my case, it is this mental image that this photograph, with its rich shadow detail and color, closely matches. This made me wonder how well the A7riii would render a natural landscape in the most extreme lighting conditions. I found out the day before completing this article. And the results are indeed thought-provoking. 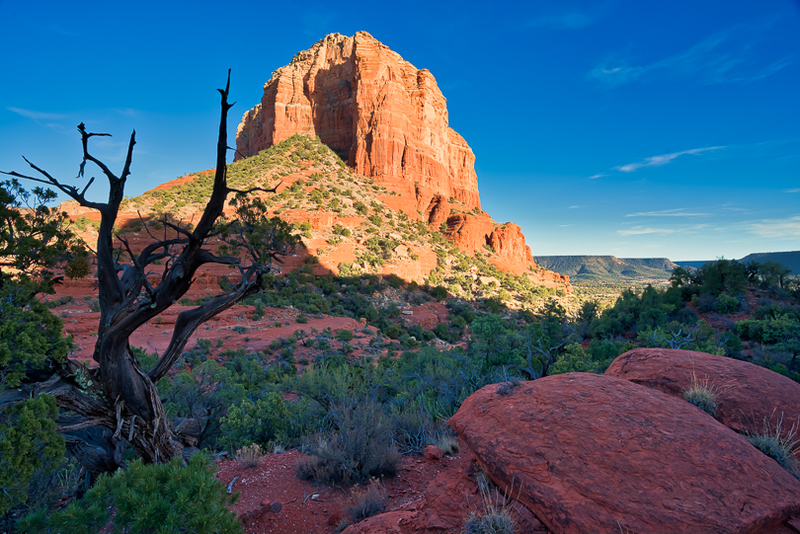 Yesterday afternoon the wind in Sedona dropped to under 4 mph. 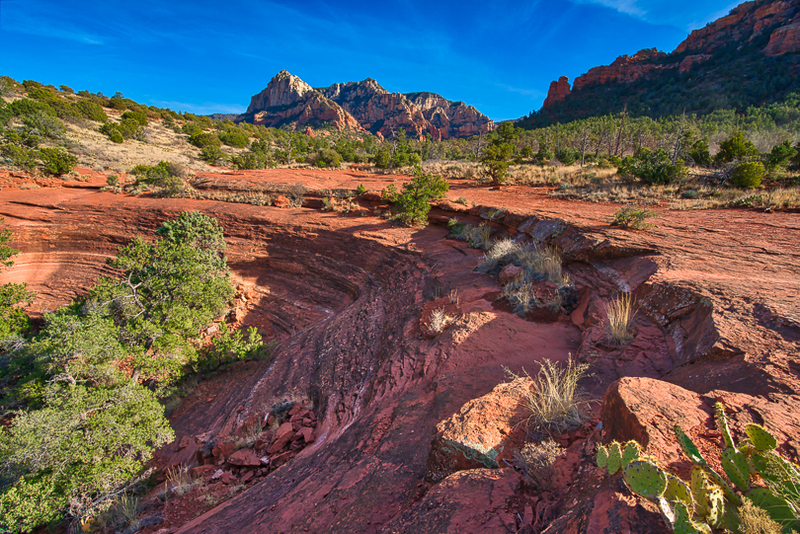 I hiked to a spot between two major rock formations where there was almost no wind at all, and, at 4:45 PM, very little light on the foreground rocks and vegetation, though Courthouse Rock was brightly lit. It took me fifteen minutes for my eyes to adjust to the deep shade sufficiently to see all the foreground detail, and to do this I had to avoid looking at the bright background. I took a series of four-exposure pixel shift images to further enhance clarity and color accuracy. 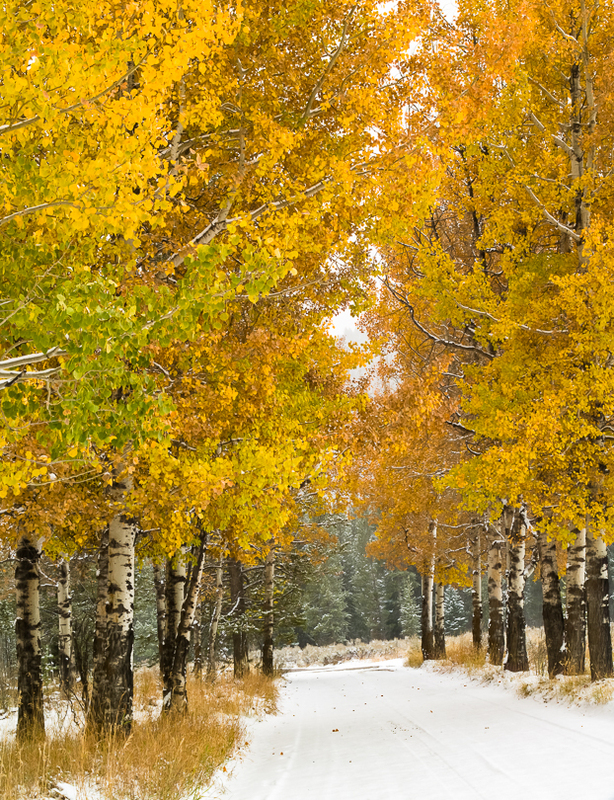 The Sony A7riii’s 15-stop dynamic range was able to extract every last detail from the dark areas except for some of the dead tree limbs which were almost pure black. This was accomplished without blown highlights, and the results are striking. However, the final image goes a bit beyond real to almost hyper-real because I know that most people walking through this scene would never see what this photograph reveals unless they stayed there for a considerable time. I wish to emphasize that despite the Pixel Shift routine which generates more color and intensity data, “Shadow and Light” is a single image with one set of exposure settings. The A7riii’s dynamic range can handle almost any natural lighting situation. In most cases, the results will appear very faithful and real. But, it seems as if this camera, without resorting to exposure bracketing, can produce out of the ordinary effects, not unlike some HDR images. Photographers can either embrace this capability to create new realities or stop short of that. So, what can be gleaned from this informal survey? Color film never attained the color accuracy produced by better digital sensors, though monochrome images like Ansel Adams’s could look quite real if the viewer is willing to disregard lack of color. With the new sensors employed in the Sony A9 and A7riii, in the Nikon D850, the Pentax 645Z and in the Hasselblad X1D-50c, high color accuracy, fine detail and clarity are sufficiently assured to regularly produce super-real high-fidelity images, even in harsh lighting, provided careful capture technique is followed. In all cases, using superb lenses designed to match or exceed sensor capability is an absolute requirement. A quick review of the lenses used to produce the above images should reinforce this point. From my perspective, the Sony A7riii deserves all of the praise that it has been receiving. It is so good that it can also produce images which though striking, move beyond what is usually considered realism to an alternative hyper-realism. Much of the above commentary would be moot if not for outstanding RAW development software. Lightroom is a certainly the best-known example. But, I find Luminar 2018 to be an outstanding newcomer. Sixteen of the above 21 images were developed from RAW files using Luminar within the Lightroom environment, with occasional subtle tweaks added later in Lightroom.